The error bars in those charts are showing about ±1 million km² uncertainty. I think that's extremely accurate considering the available data. It's about twice the error bar for the satellite age. Approximately twice that of the satellite age. I don't know, that does not sound too unreasonable to me. There is some error associated even with satellite observations (precisely determining areal extent is more difficult than you might imagine). And the available observational/proxy data is perhaps better than you might think. But to be fair, I am not an expert in sea ice extent reconstructions or the uncertainty associated with them. Are you? Do you have a quantitative assessment for why the uncertainty bars should be of different size, or know of studies that yield strongly contrasting results? We have little ice data, but I think we should take the many reports from amazed fishermen, trappers and scientists of the 20's seriously. They are taken seriously; scientists do not ignore good data when it is available. Indeed, they are a significant component of the data used to make these reconstructions. JFM/AMJ (Winter/Maximum Extent) --> Smaller error bars. JAS/OND (Summer/Minimum Extent) --> Larger error bars. There is no display of error bars in this figure, but you can see the same effect -- maximum sea ice extent is less variable than the minimum, for the reasons you intuited. And you can see the effect of the warming during the 20s and the subsequent cooling, especially in the Nordic Sea, but also for the total Arctic September extent. It's also pretty evident that it's natural variability -- normal ups and downs of the climate system. The important thing is the underlying trend associated with global warming. Yes, satellite data need processing and careful interpretation so inaccuracies are unavoidable. But compared to the data that can be obtained from ground it's a huge difference. We're speaking of an enormous area and few people in the area to report what they see. And it's even something very dynamic, changing every day. All we can get are very local snapshots of the situation. We can mostly guess what the bigger situation is based on how the ice normally behaves, which of course will give a natural bias towards the average. But we don't really know the big picture. The satellite's eye of the situation is entirely different, even though it's not extremely accurate. What do I know? All I can say I have is a very basic experience and understanding of what some of this looks like and behaves on the ground from planning and navigating in arctic waters in small vessels (ranging from 27' to 36'), twice in Svalbard and I've visited these island by other means regularly since the 90's. Satellites have become an extremely helpful tool. Not meaning that you can fully rely on them, which you couldn't even if they gave an exact view of the situation, since everything changes rapidly (wind and currents). I think I can see what you are trying to show, though it's not very clear and I don't have a clue what the source figures were. I'm not even sure which report they came from. Can you please help me out by posting the originals? I've been trying to avoid any confusion by giving clear citations, let's please try to do that both ways. The figures were from your post Thursday 05:02. It surely must be permissible to assume that you recognise something from what you've just posted? Oh, jeez, what a mess. This post should resolve all of it. It was a fair assumption, and I was pretty sure I recognized the future projections part of the figures. The problem was that I assumed that in talking about reconstructions/observations of historical sea ice extent, you would be using figures that actually use historical data. Now with some relief we've finally resolved your questions about the error bars and lack of response to the internal variability during the 20s. In looking at the correct figures, you see exactly what you intuited. P.S. I'm not faulting you over this or anything; without reading the text associated with the figures it is extremely easy to misunderstand what they're showing. So when the models fail to reproduce in the past a known physical property, we shouldn't have very high expectations for them in the future. The extra JAS sensitivity surely doesn't only apply to natural variability, but surely also oce-atmosphere interactions. But as for the extent, I see a JAS error bar whose lower end is above all years since 1979 for which we have satellite data. Yet, reports from the 20's and 30's speak of areas of open water that even in recent years have closed in summer (such as north of Spitzbergen). Of course, this proves nothing since the arctic ocean is a vast area, but that's my point, the uncertainty is high. It was also colder in the 80's than in the 20's. It simply doesn't appear credible. ADDED: The northwest passage seems to have been navigated in one season for the first time in 1932 by the Sibiryakov, it would have been interesting to study accounts from that voyage. But accounts concerning the northeast passage would be more telling, since this is where we find the vast areas of open water in recent years. A bit of googling take's me to Humlum's site, where he mentions Stalin taking interest in the NE passage (presumably inspired by the Sibiryakov), which led to increased research activity in the area. Data from that ought to exist. But they might have been a bit late for the party in the mid 30's and onwards. I highly doubt that any year in the 20's or 30's was anywhere close to 2007 or 2012, though. The current warming has now run longer and possibly to a higher level. But the error bar requires vast areas to have been fairly certainly closed all the time, for which I'd like the hard evidence. I also found an interesting discussion on Judith Curry's blog by Tony Brown. So when the models fail to reproduce in the past a known physical property, we shouldn't have very high expectations for them in the future. I disagree. The models should only be expected to produce accurate long term trends, not accurate year-to-year predictions. If the trend the model shows for past ice extent matches the observed trend, then it should be considered an accurate model, albeit one with low temporal precision. But that's fine; we're not looking for a model which will show us exactly what the ice sheet extent will be in the year 2047, we're looking for a model which will show us what the trend will be for that extent from 2010-2080, for example. And for that purpose a model like this works just fine. That wasn't really what was in question here, but rather within what range we should expect the extent to be in a year like 2047. I'm addressing the uncertainty. Does it really matter? As long as you can accurately predict long-term trends then what does it matter if you know the uncertainty at any given point or not? In this particular case I don't see what practical difference it makes, aside from being able to check when we arrive at that point in time whether the observed data is within the range of the prediction, and by that time the current models will be obsolete anyway. Anyway, if you had a model that was 100% accurate at predicting long term trends, then the uncertainty would be equal to the magnitude of natural short-term (annual/decadal) variations. 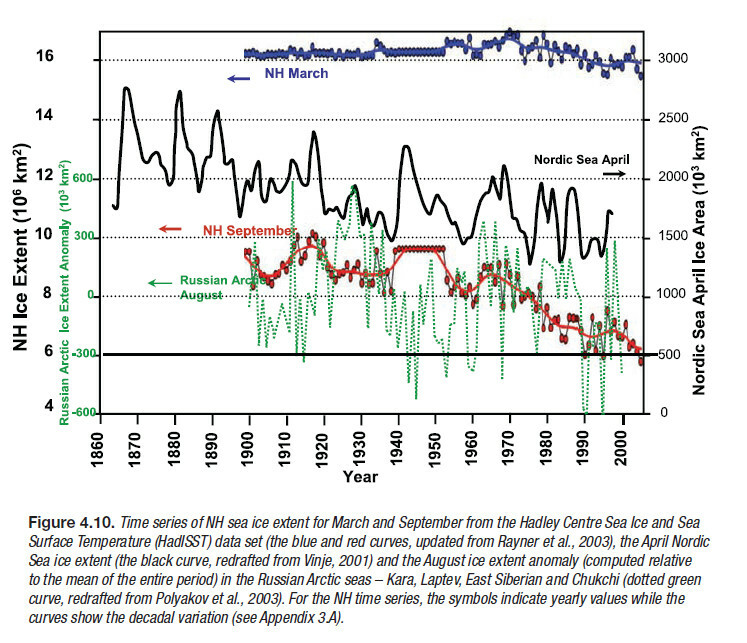 (b) Historical sea ice data do not show the expected behavior based on reports from the 20s. When looking at (a), we are examining predictions, based on models, which means that we should be looking at AR4 Chapter 10: Global Climate Projections. When we do so, and examine the consensus prediction, we find that the prediction of ice-free summers by 2013 was an enormous outlier. When looking at (b), we are examining data, based on observations, which means that we should be looking at chapter 4: Observations: Changes in Snow, Ice and Frozen Ground. From either AR4 or AR5 (and you'll note I've done both). When we do so, we see that the reconstructions do show the natural variability that you were pointing out, and the relative sizes of the error bars make sense, too. There is nothing insightful to be gained here by using the wrong figures for the wrong discussion points. Do not confuse the effects from natural variability for the effects from the underlying global warming trend, which is what the models are looking at. 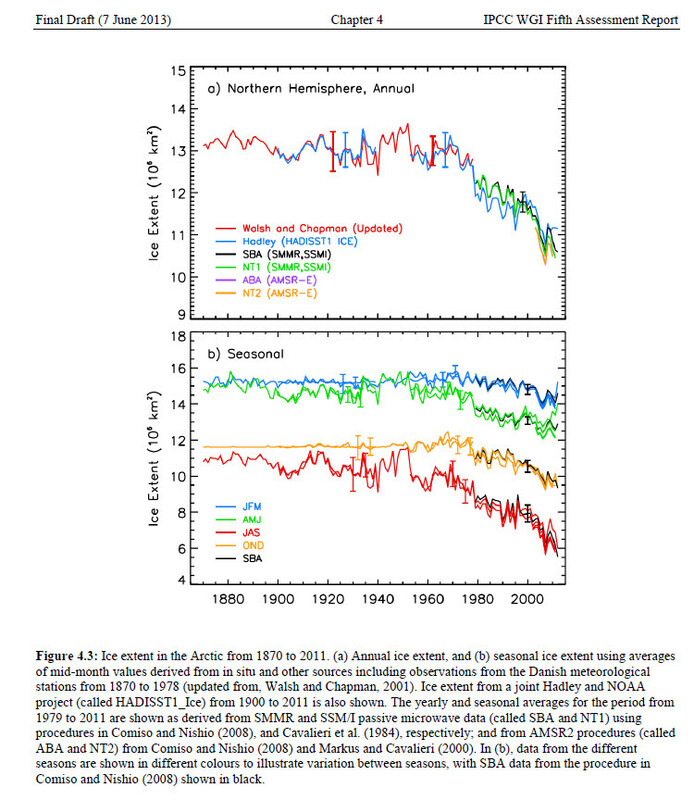 I was just saying that the extra JAS sensitivity will also be at play in a global warming trend. EDIT: sorry about the somewhat reverse order here. I've been writing bits a time. That was just a remark on trusting and the danger of predictions for the first ice free summer. I don't think many took it seriously, though there wasn't a loud outcry that it certainly wouldn't happen either. Such predictions are usually phrased with a "could" anyway, by which one can get away with almost anything ultimately. When we do so, we see that the reconstructions do show the natural variability that you were pointing out, and the relative sizes of the error bars make sense, too. Was I using the wrong figures when I pointed out that the lower end of the error bar for the 20's is above every year in the satellite based era? The discussion that I invite is whether that certainty about the 20's is credible in face of the accounts available and the lack of them. I certainly do not deny the possibility that it could be so, but how can we be so sure? Yes, since it's a corner stone of science that any claim must have clear ways of disproving it. That you already know. There can be no exceptions even if we expect the models to become obsoleted. The more permissive a model is in being proven correct, the less its scientific value is. A projection only based on simple ice-atmosphere interaction may already be on this ice in this respect (sorry for the pun) in assuming that all else remains the same. But in atmospheric science there is very little "all else remaining the same". It's a difficult task to extract the right signal and perform verification. I would very strongly recommend a reading of AR5 Section 12.4.6.1 here... may I ask that you please do so before we continue? No, because validation does not require prediction of exact values. Probability distributions and correlation functions are standard scientific principles that can be and are applied here. The discussion that I invite is whether that certainty about the 20's is credible in face of the accounts available and the lack of them. The discussion is an extremely fine look at one example of natural variability and honestly I find it neither very interesting or relevant here. But yes, the certainty is credible. The long term trend has been that of loss so you expect a priori the satellite era to be lower than the early 20th century on average. But we know that natural variability is important, too, so observations are key here. The reconstructions are based on historical accounts (including the ones you mention! ), models, and proxy data. Without satellite data or widespread direct observational data you expect higher uncertainty in these reconstructions, and that is consistent with what you see in the figures. Nevertheless, the results show that the average extent in the 20s was very likely (within 1 sigma) higher than anytime in the satellite era. The cooler period you noted in the 80s isn't a compelling reason for expecting otherwise, either. The sea ice extent is not going to completely recover to levels from 50 years prior by just one decade of cooler temperatures. The abundance of thick multi-year sea ice is very important to consider here also, as it determines the survivability of ice during the summer. With global warming we're losing a lot of that multi-year ice. I fear you are allowing your skepticism to severely impede the process toward a rational understanding of how these models work, as well as their purpose and scientific value. An ice-atmosphere model means that it models sea ice extent as a function of atmospheric temperature. It is a very good correlation, and it reproduces the historical sea ice extent extremely well, minus the differences that it does not account for -- natural variability. The models don't consider it, and we are not overly concerned about it, because we can't predict natural variability decades into the future. We are instead looking at the long term trend as related to global warming. Yes, there is enormous uncertainty involved in these projections (the future of sea ice extent is quite possibly the most uncertain thing in all of climate science, followed by sea level rise), but there is nevertheless excellent scientific insight to be gained from them. Where do I say exact values? I tried to explain Harb the same thing, and my remark on validation was on uncertainty (error bars, probability, range, bounds, accuracy, sigma, dispersion, variance, confidence, whatever the magic word is for getting through that I do no speak of exact values). The long term trend has been that of loss so you expect a priori the satellite era to be lower than the early 20th century on average. For that you need to establish roughly a point of time when the long term trend as been sufficiently at work to outweigh natural variability. But note that I'm speaking of what happened in the 20's. The earliest part of the 20th century was extremely cold, which made the 20's warming dramatic. The sea ice extent is not going to completely recover to levels from 50 years prior by just one decade of cooler temperatures. Any evidence for this statement? You don't say what you mean by lower temperatures (temperature itself isn't warm or cold ). But let's say conditions for the next decade dropped to that of the 60's. Are you saying that we after 10 years wouldn't have similar ice extent as in the early 1970's? Relatively little ice in the arctic stays for many years. Ice drifts towards America, and old ice is drained through the Fram Strait, and it's been like this before the CO2 emissions entered the scene. I don't know how many years it takes (you do?). History, however, tells us that we are repeatedly surprised how fast things change in the Arctic. I don't know how they made this animation, but apart from illustrating the mechanism, it looks pretty cool. it reproduces the historical sea ice extent extremely well, minus the differences that it does not account for -- natural variability. Of course, if natural variability is seen more or less as observations minus model output. How would you avoid that pitfall? which shows the pattern strongly hinted by the Svalbard data (though the polynomial trend at both ends should be taken with a bucket of salt). How are they able to mostly remove the 20's and 30' warm period?? If they can do that, it's no surprise that the disappearing ice reported in the 20's and 30's hardly is reflected in the historical ice extent graphs. This is just not credible. Am I the only person here who actually reads the figures and the text associated with them? The CMIP5 model simulations exhibit an ensemble-mean polar amplified warming, especially in winter, similar to CMIP3 model simulations (Bracegirdle and Stephenson, 2012; see also Box 5.1). 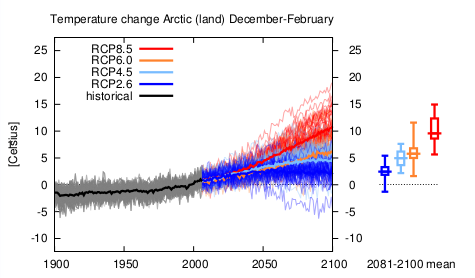 For RCP4.5, ensemble-mean winter warming rises to 4.6°C over pan-Arctic land areas by the end of the 21st century (2081–2100), and about 7.4°C over the Arctic (Table14.1). 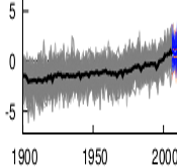 Throughout the century, the warming exceeds simulated estimates of internal variability (Figure AI.8). In summary: It is likely Arctic surface temperature changes will be strongly influenced by anthropogenic forcing over the coming decades dominating natural variability such as induced by NAO. I.e., it's looking at how the future warming under various emissions scenarios compares to the internal variability. It is found that the warming exceeds the internal variability under a range of scenarios through the 21st century. It is not the purpose of the figure to resolve every short term fluctuation. If that is your interest then you should pursue a different graphic/study. Like the one you started with. Yes, the region may contain the observed variations over a couple of decades (note that we're comparing winter and annual anomalies, but if we had an apple to apple comparison here, what you say would probably still hold). 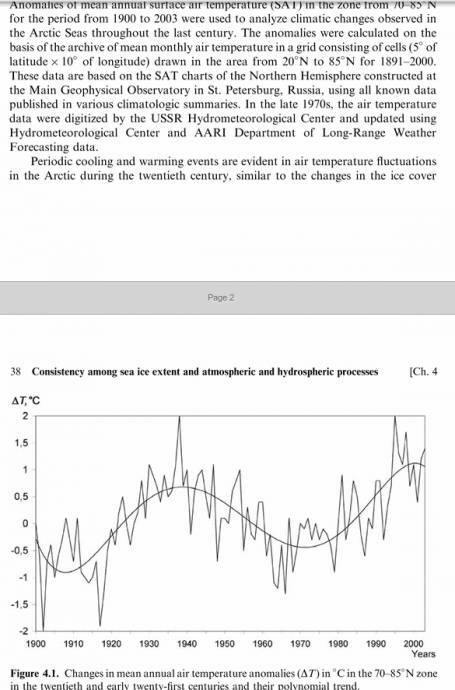 However, if the IPCC figure is so smoothed that the fluctuations in Frolov mostly disappear, they can't at the same time show a rapid increase around 2000 reflecting the recent warming, because it remains to be seen whether this is a real trend or simply a fluctuation as in the 20's and 30's. We don't know that yet. But if Arctic temperatures do begin to drop again over the next years (they haven't yet, but we could be at a flat but bumpy top), that would conveniently explain why the recent warming and ice loss have been greater than projected. And I would suppose that a better understanding of this would greatly improve the projections for the end of the 21th century.